Heroics from skipper Waqas Ali led Redditch Entaco to victory. Picture by Marcus Mingins. 2518007MMR2. Ghulam Moyhuddin was frustrated by this near miss, but took three wickets to help the Kingfishers to victory. Picture by Marcus Mingins. 2518007MMR1. Wicketkeeper Tim Fitch top-scored for Redditch against Newport. Picture by Marcus Mingins. 2518007MMR3. 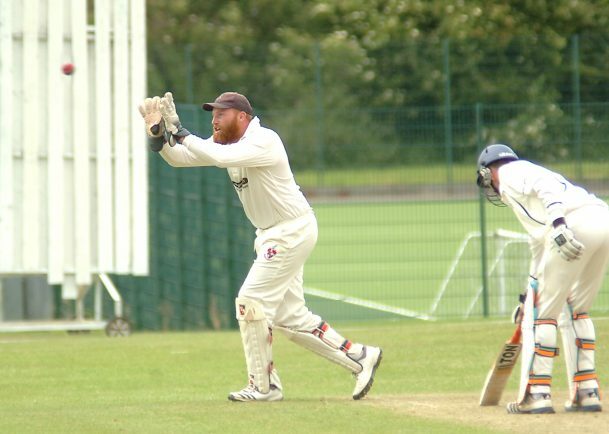 REDDITCH ENTACO secured their first home win of the Birmingham League Division Three campaign as they defeated visitors Newport by 25 runs in a low-scoring affair on Saturday. It was a day to savour for the club, as all four Kingfishers sides enjoyed wins. The firsts, who climbed to seventh and will look for further success at Worcester outfit Old Elizabethans on Saturday, were indebted to a match-winning performance from skipper Waqas Ali who took 6-36 to help dismiss the visitors for 142 in their pursuit of 168 to win. Earlier, Redditch had struggled with the bat as only keeper Tim Fitch (36) and Yassar Altaf (24) contributed. 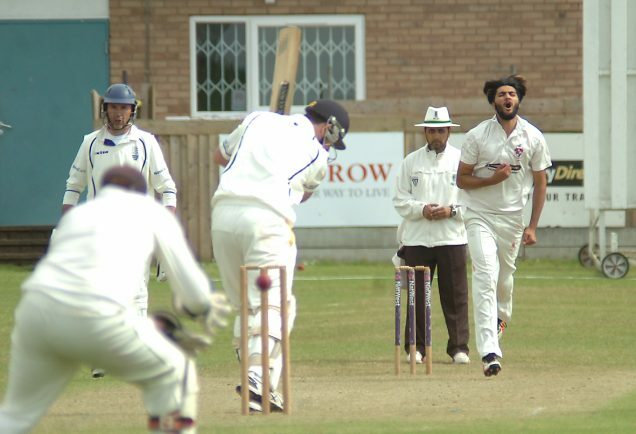 In reply, Newport were always up with the rate thanks to a fine innings of 80 from opener Simon Douglas but Redditch responded thanks to high-quality seam bowling from Ali, backed up by Ghulam Moyhuddin who took 3-26 as Redditch took the points in style. The seconds moved up to third in Division Two 2nd XI thanks to a 22-run victory at Sutton Coldfield’s Rectory Park. Redditch totalled 185-9 after opener Nick Fowkes found form with 56, backed up by Faizan Ahmed who scored 39. 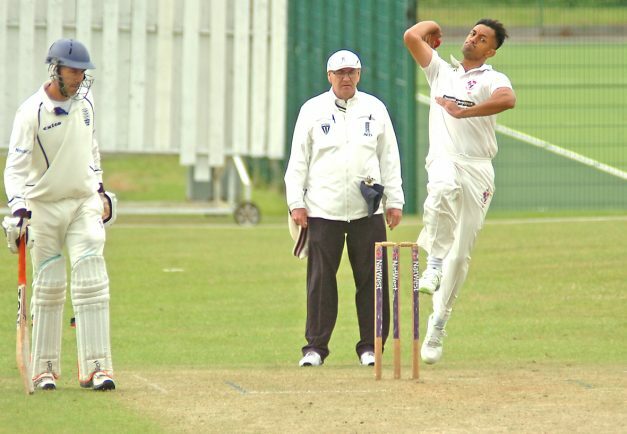 Sutton Coldfield struggled against the Redditch bowlers and could only muster 163 as Raheem Basharat (3-79), Fowkes (2-26), Mo Zahid (2-34) and two late wickets from Sahil Mahmood (2-3) did the damage for Redditch, who host Old Elizabethans on Saturday. There was a welcome Worcestershire League Division Five victory for the thirds who beat Old Hill by 34 runs at the Entaco. Redditch posted a challenging 209-8 off their 45 overs with skipper Liam Phelan top-scoring with 39, Haleem Basharat making 36 and Aleem Shahid adding 34. Old Hill started well thanks to 53 from Gupreet Singh but Redditch bounced back through Kevin Lokenath (3-39) who was backed up by 2-15 from Shahid and the wily Ben Hicklin (2-32). On Saturday the thirds visit Harvington. The fourths moved up to second in Division Eight North thanks to a mature innings from opener Dean Ottley who scored 86 as Redditch made 205-8 off 45 overs in a 119-run victory at Enville. Redditch dominated and only 42 from Luke Darby offered resistance as Enville were bowled out for just 86 with Tayyab Muhammad taking 5-33 as he celebrated his 14th birthday in style. Coombs Wood are the visitors to the Entaco on Saturday.